Moving house is a big deal for us. But what about our cats? Cats are creatures of habit that get their feeling of security from being surrounded by familiar sights, sounds, and scents. 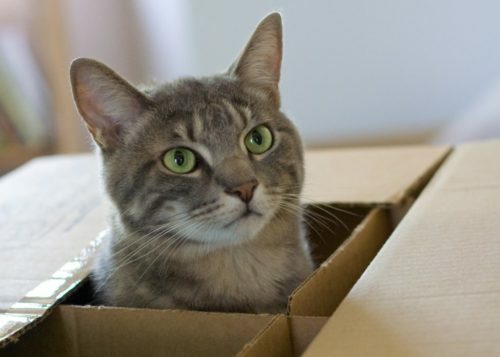 Moving takes away that sense of security so spare a thought for your cats when you’re getting ready to move! 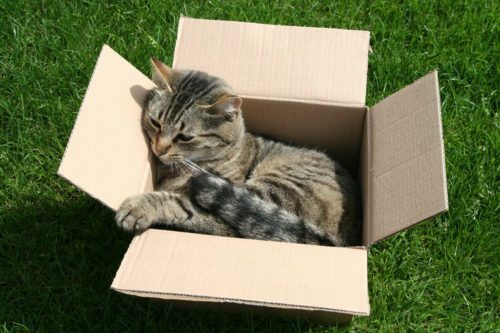 Take a look at the tips below to make moving house with a cat stress-free for everyone. Just as in all moves, you need to plan ahead when it comes to moving house with a cat. You have two options for the big day: have someone else watch over your cat or take them with you. 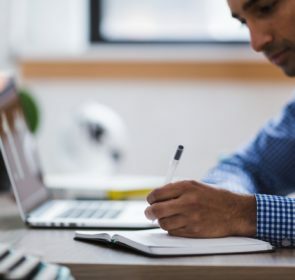 Which choice is the right one depends on your preferences, the availability of cat-sitters or boarding catteries, and most importantly, your cat’s character. Having someone to help you usually makes moving with cats much easier. If you take this option, you should try to arrange for someone to watch over your cat well in advance. This is to make sure that someone is actually available during your moving day. Ask friends and family early on so they can fit cat-sitting into their schedule. The person who will look after your feline friend should ideally be familiar with your cat. Also, since cats are extremely territorial and depend on routine, you should pick a place that they are at least familiar with. 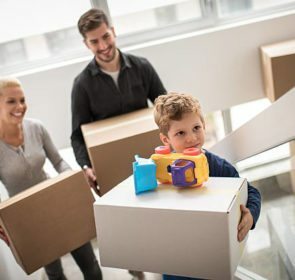 To make this easier, try easing them into their temporary home for the moving day by taking them to your friend or family member’s place beforehand. Taking your cat to the boarding cattery is probably the easiest option. You can have your cat stay at a cattery for a few days so you won’t have to worry too much about them until you’re settled into your new home. However, you’ll need to book well in advance and ensure that your cat’s vaccinations are all in order. Also, this option costs you a bit of money. Moving cats to a new home can be done without the help of others. If you think it’s better to take your cat with you on big day, then here are a few tips to make it easier to handle! A few weeks before your moving day, clear a room and designate it as your cat’s personal space. This room will house your cat on the big day and make sure she doesn’t roam around. Place your cat’s important items inside—food, water, bed, toys, litter tray, scratching post, and other favourite items. At the same time, start planning for a similar room in your soon-to-be new home too. On the actual moving day, this is where your cat will stay until everything settles down. Again, this is just a temporary space until you can find a proper place for your cat. Both of these rooms should be out of the way so that your cats won’t be in the middle of all the chaos. Don’t forget to tell movers that this is the cat’s throne room and should not be disturbed! Around one or two weeks before you move, start introducing your cat to their new space. Begin feeding them in this room so that she accepts it as her room. This step is important! If they don’t get used to their new (temporary) room, they’ll throw a furious fit when you shut them in on the moving day. If you have more than one cat, it could be better to set multiple rooms for each one. This, of course, depends on their personalities and whether they get along with each other. The last thing you need is to worry about your cats fighting in a closed off room during the move! This might sound harsh, but you need to shut them in on your moving day. 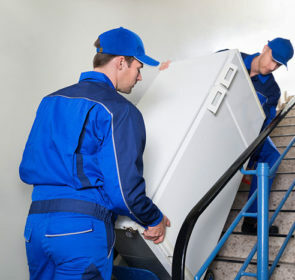 You need to stop them from walking around with all the movers all throughout your house. Not only will this slow down the loading, this is a safety hazard for you, the movers, and your beloved pet. If your cat is used to having the freedom to wander around and enter and exit as she pleases, this will be difficult. It’s highly likely that your cat will feel bored or stressed from being cooped up inside all day but this is necessary. To help calm your cat down, it’s worth asking your vet for some synthetic pheromones. These come in a spray or plug-in diffuser. 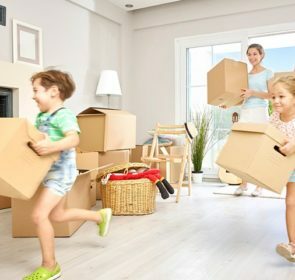 Moving day is here and it’s the moment you’ve been waiting for! 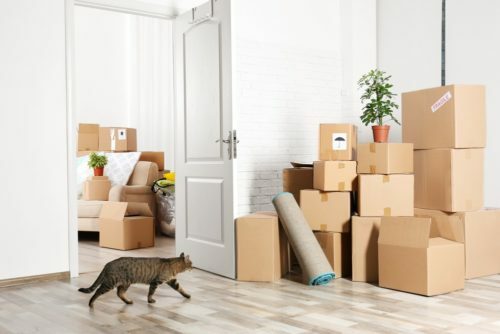 Here are some tips for when you actually start moving home with a cat that will help them get used to their new home. Move your cat into their new room, together with all the items they had in their previous room. It is a good idea to give them something with your scent, such as an unwashed piece of clothing, to help them calm down. Again, keep this room out of bounds for family members and movers—you don’t want your cat running around just yet. In a new environment, your cat can easily become overwhelmed. To avoid this, keep them in their room for a few days before gradually introducing them to the rest of the house. Always make it clear that their room is always available if they need a place to retreat to. How quickly your cat starts to be comfortable with their new home really depends on their personality. Some cats are adventurous and will take to their new surroundings almost immediately, while others take more time. Ease them in by giving them the freedom to explore the house at a pace that they are comfortable with. Although you should let them walk around the house on their own, make sure that all the windows and external doors are shut. You need to show to your cat that this is their home from now on. Also, the last thing you want is a missing cat! Even though it may seem cruel, your house should be on lockdown during the first two weeks at your new place. This is especially important if you’ve moved not too far away since your cat might end up wandering back to your old neighbourhood. Just in case, warn your old neighbours that there is a chance they might see your pet making its way back. Once your cat is ready to venture outside, you’ll need to microchip your cat and make sure that your contact details are up to date. At the very least, put a collar with their name and your address on your cat. With proper identification, you can easily track your cat if she decides to wander off. And with up-to-date contact details, anyone who finds her will get in touch with you quickly and easily. 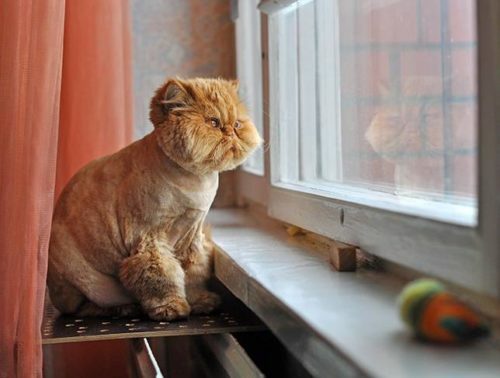 When you do let your cat out, time it just before mealtimes. This way, you’ll be able to call them back with the rattling of their favourite food. 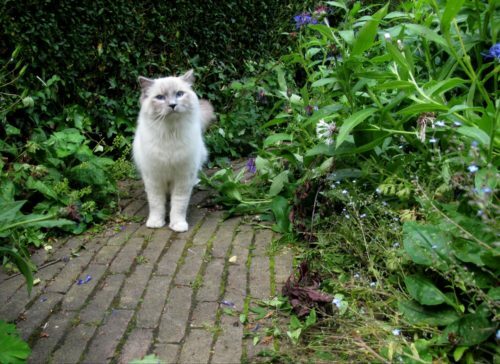 Keep an eye when your cat first steps outside and let them make the decision to go out on their own. Also, leave the door open so they always have access to a safe, secure place. At the beginning, you should let them out for short periods of time. But as time goes on, increase their time outside. As long as you haven’t let your cat outside too early, they’ll have built up a strong scent profile to help them find their way back home. If you’re switching to a new vet, make sure to register with them either before you move or immediately after. They’ll most likely need your cat’s veterinary history so don’t forget to have this ready. 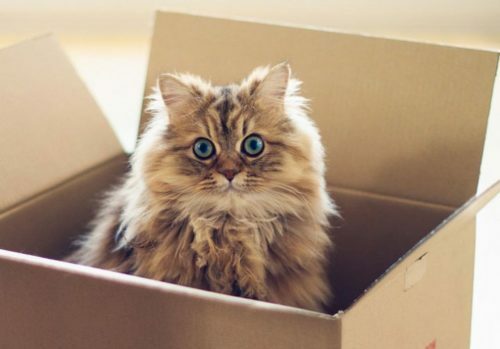 Moving house with cats doesn’t have to be difficult. As long as you follow the tips above, your feline friend will be calm and quickly adjust to their new home. And most professional moving companies understand that your cat also needs to be taken care of during this tumultuous time. Make sure you find the right company who’ll help you with moving cats to a new home.